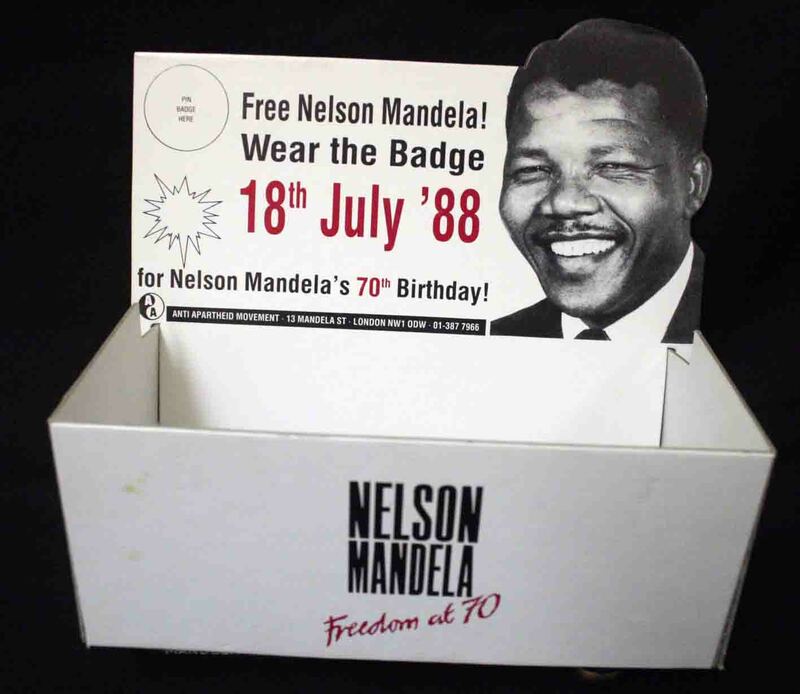 Display box for the badge produced for the ‘Nelson Mandela Freedom at 70’ campaign. The AAM aimed to get 1,000,000 people in Britain wearing the badge on Mandela’s 70th birthday, 18 July 1988. For the 20th anniversary of the first democratic elections in South Africa on the 27th April a website has been launched recording the history of the Anti-Apartheid Movement in Britain. Funded by the Amiel & Melburn Trust and the Heritage Lottery Fund, ‘Forward to Freedom: The History of the British Anti-Apartheid Movement, 1959-1994’ (www.aamarchives.org) summarises the history of the Movement and makes freely available a selection of documents and other items held in the Anti-Apartheid Movement (AAM) Archive in the Bodleian Library, University of Oxford, and some items from other repositories and in private collections. Exhibition boards based on the website are available for loan and an education pack for schools (Key Stage 3) is in development. The Movement began in the summer of 1959 when a group of South African exiles and their British supporters called for a boycott of South African goods in response to an appeal by the AfricanNational Congress (ANC) and the All-African Peoples Conference. Led by Tennyson Makiwane of the ANC and Patrick van Rensburg of the South African Liberal Party, the group took the name ‘Boycott Movement’ and called for a national boycott month in March 1960, winning the support of the British Labour and Liberal Parties and the Trades Union Congress. The month of action began with a rally of 8,000 people in Trafalgar Square addressed by the Labour leader Hugh Gaitskell, Liberal MP Jeremy Thorpe and Father Trevor Huddleston. During the month many local authorities joined the boycott, over five hundred local boycott committees were established, leaflets were distributed describing life under apartheid for the black population and three editions of a newspaper, Boycott News, were published. On 21 March the South African police opened fire on men, women and children protesting against the pass laws at Sharpeville in the Transvaal, killing sixty-nine. 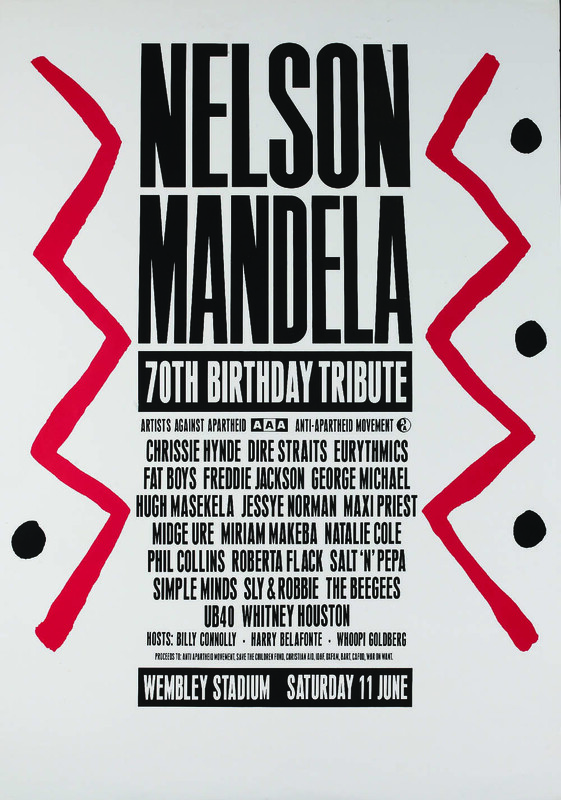 Poster advertising the concert held at Wembley Stadium on 11 June 1988 as part of the AAM’s ‘Nelson Mandela: Freedom at 70’ campaign. The concert was attended by a capacity audience and broadcast to 63 countries. It was organised by AAM and Artists Against Apartheid. These shootings, when British-made Saracen tanks had been used, led to strong international protests and, in London, to another rally in Trafalgar Square and demands for the termination of British arms supplies to South Africa. In South Africa itself a state of emergency was declared and the ANC and the recently formed Pan African Congress were banned and went underground. The members of the Boycott Movement realised that a permanent organisation was needed to campaign for the eradication of apartheid and during the summer of 1960 the Movement was restructured and renamed the Anti-Apartheid Movement (AAM). It resolved to work for the total isolation of the apartheid system in South Africa and to support those struggling against the apartheid system. 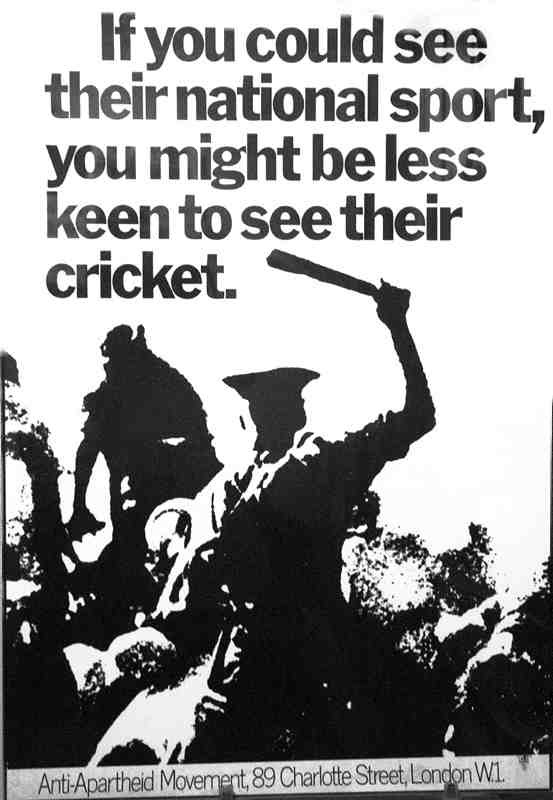 Poster to mobilise opposition to the all-white South African cricket tour planned for 1970. Along with Stop the Seventy Tour (STST) and the Fair Cricket Campaign, the AAM succeeded in forcing the Cricket Council to cancel the tour. The website summarises the history of the Movement through the 1960s, 1970s, 1980s and 1990s to 1994 and the AAM annual reports are available for download. The major campaigns which the AAM organised are covered – the consumer and sports boycotts, arms embargo, disinvestment campaign, particularly targetting Barclays and Shell, and support for political prisoners – and these are illustrated by a selection of photographs of events and examples of the posters, leaflets, postcards, pamphlets, badges and other material created to raise awareness. The groups involved in AAM are also described from students and trade unionists, to local authorities, churches and professional groups. Memoranda and reports written by AAM when lobbying the British government are available for download. The website also includes audio-clips and full transcripts of interviews with 35 activists and supporters and video-clips of AAM concerts and of interviews recorded for the Clarity Films production ‘Have you heard from Johannesburg?’. The material on the website forms only a small proportion of the whole archive, the catalogue for which can be seen at http://www.bodley.ox.ac.uk/dept/scwmss/wmss/online/blcas/aam.html . 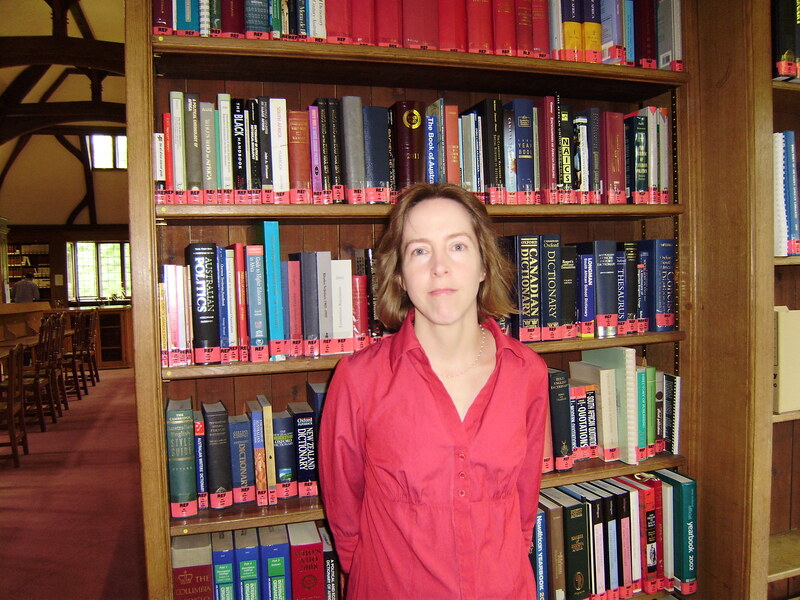 Lucy McCann is an archivist at the Bodleian Library, University of Oxford, and Secretary of SCOLMA (the UK Libraries and Archives Group on Africa). 45 years ago: The controversial visit of the Springbok team to Dublin. | Come here to me!